Today's stitch is a variation on a common theme on whimsicalstitch.com. 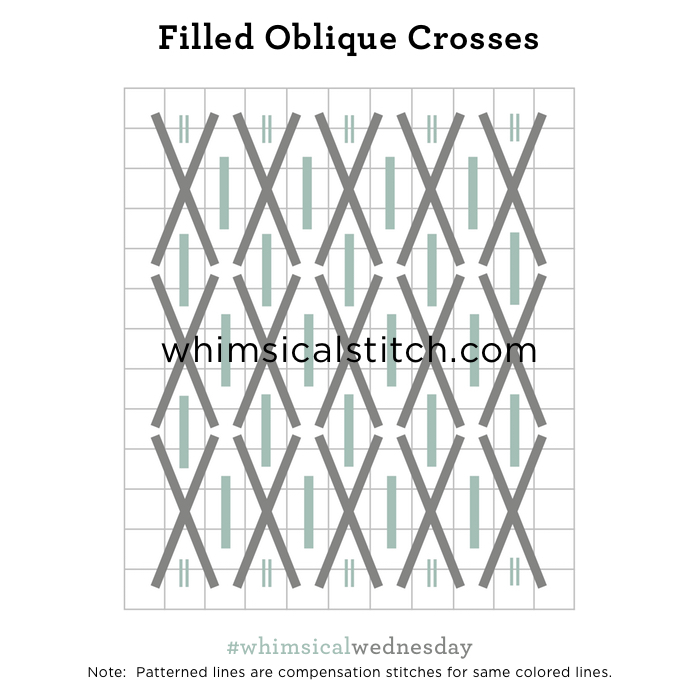 I do love my Oblique upright crosses. But what I really like about this is the understated thread combination. This is the shirt from Joachin by Sandra Gilmore that I stitched in the early 2000's. The threads are a single strand of Impressions (gray lines) and an overdyed floss for the vertical straight stitches in the center (aqua lines). I'm so used to mixing thread finishes in a stitch, this popped out to me. It's a nice reminder contrast isn't exclusively thread finish. As with most perfectly symmetrical stitches, this would be great for architectural elements such as a roof, floor, tabletop, or walls. We see it works for clothing. It would also make a great tree trunk or other greenery. Not all greenery needs to be dramatic. This is a good companion stitch where you have multiple green spaces. Put the drama in the one you want to stand out and use this stitch for the other. Consider replacing the vertical straight stitch (aqua lines) with a single bead over two rows (in either direction!) for water, clothing, or even flower petals. The bead technique makes this a more open stitch, so the shading will show through.